Apostolos Doxiadis | Apostolos Doxiadis is a writer whose international bestseller Uncle Petros and Goldbach's Conjecture helped start the mathematical fiction trend. Yet his work as novelist, playwright and essayist moves in many different directions. 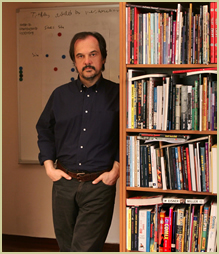 Apostolos Doxiadis is a bestselling novelist, graphic novelist and scholar, whose work has carried storytelling into new, unchartered areas. A New York Times No. 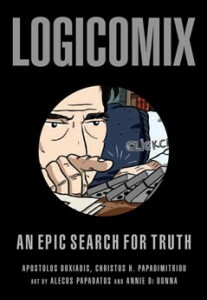 1 Bestseller, Logicomix uses the medium of comics to tell the fascinating story of the quest for the foundations of mathematics, through one of its most interesting protagonists, Bertrand Russell. Apostolos and mathematician Barry Mazur bring together a collection of original essays by mathematicians, philosophers, historians and writers, on the unexplored connections of mathematics and narrative. Apostolos’ contribution outlines his theory for the genesis of proof, in Ancient Greek mathematics, as an application of poetic and narrative techniques. The first novel to be termed by critics “mathematical fiction”, Uncle Petros blends the agonized quest for an elusive mathematical truth with the dynamics of a modern Greek family, across two generations.